Yaogun is still at that point where it’s news when it gets on television. Particularly when it is shown on China Central Television (CCTV) — though in the Chinese television landscape, there is no less “Central” television station, the impression one gets when one says CCTV is of the Government’s living room. So when word came, via Rock in China‘s Max and the rest of the gang at the RiC Facebook group that metal band Suffocated was on CCTV-5, it got my attention. CCTV-5 is the national sports channel. 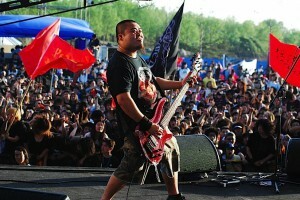 For two days in early June, the network took over Beijing’s Star Live venue to tape two-dozen-plus local acts to spread across their Euro Cup coverage. Each midnight of the Cup tourney, CCTV-5 will talk with and feature one of the participating bands. Those of us outside of China are unable to check out the action, since CCTV-5’s videos on their site are not accessible outside of China, but through the kindness of some rockers (like Beijing Daze) glimpses are attainable. Unfortunately, the clip below cuts out right when the band is about to answer a question brought on by the host’s almost actually genuine interest in and enjoyment of the lyrics, but it’s a great window. Alas, exhibit A in the case against yaogun ever truly having a place on this network is the in-studio portion of the segment, which fades in on the always-rockin’ keytar being played by the Stay-Puft Marshmallow Mannish mascots and pans out on the polo-shirted audience members clapping along in a fashion that the word ‘automoton’ would only begin to describe. In 1993, when on tour in Germany, metal band Tang Dynasty was asked about the potential for appearing on television in their native land. Lead singer Ding Wu was pretty clear: “For us, it’d take a long time. We have to go slowly. China is starting to open up, but we have to take it one step at a time.” The key there was that he didn’t rule it out, and they would, in fact, appear nationally before the decade was out. But every time those mascots wave their arms, or the host grins that smarmy grin, you have to wonder: Is it worth it?